Let it be known that there are sixteen people who were arrested here on November 26 and 27, 2013 for loan sharking activities. The suspects are believed to be members of illegal money lending organization. Loan sharking is illegal here in Singapore. The suspects will face mandatory imprisonment for up to 4 years and they will be fined from S$30000 to S$300000. Not only that, they will endure not more than six hits of cane. Large loan fees: You should know that loan sharks charge big loan fees on top of the interest rate. The borrower may not notice this because loan sharks try to be inconspicuous when it comes to this. 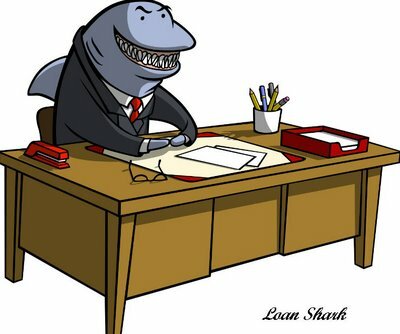 High interest rates: Loan sharks are known to put high interest rates. Interest rates could go as much as 5% of the total loaned amount. Legitimate lenders offer lesser rates even if you have poor credit rating. Spotting loan sharks: Loan sharks target individuals who are desperate for money. They offer “convenient” application and do not make a fuss about other things like requirements and credit rating. Loan sharks will also entice you to borrow as much as you want. Borrowing money is acceptable because sometimes, we feel lacking but borrowing from loan sharks is never a good idea. They operate by threatening and harassing their borrowers. If you are thinking about borrowing money, do not be desperate and simply settle with loan sharks. There are many solutions. You only need to discover it. This entry is filed under Money Talks.